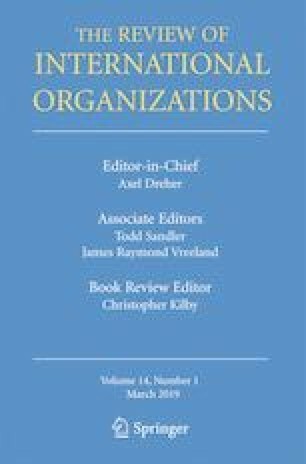 Popular non-support for international organizations: How extensive and what does this represent? This paper investigates popular non-support for international organizations (IO), asking two questions. First, are attitudes within the mass public becoming less supportive of IOs? Second, how can we explain these IO attitudes, especially when the mass public appears to know relatively little about specific international institutions? Using survey data from the International Social Survey Programme’s National Identity module, fielded across multiple countries in 1995, 2003, and 2013, it reports that on average and within most countries, citizen attitudes about IOs have become less positive over time. To explain these attitudes, this paper argues that citizens tend to group things that appear as “international” such as cross-border economic flows and IOs. While citizens might feel positively or negatively about these international factors, this grouping implies that they view them similarly, based on what they can feel from the international level related to their job and income. Thus, less (more) skilled citizens who are hurt by (who benefit from) economic globalization should express more negative (positive) views about IOs. Controlling for cultural attitudes socialized through education, we find that skill is a statistically significant and substantively strong predictor of IO attitudes. We also show how this individual-level skill difference gets larger in countries that are more and/or less-favorably exposed to economic globalization. The online version of this article ( https://doi.org/10.1007/s11558-019-09351-3) contains supplementary material, which is available to authorized users. An earlier draft of this paper was presented at the PEIO conference in Madison, WI in February 2018. We thank three anonymous reviewers, the many conference participants, Inken von Borzyskowski, Ryan Brutger, Julia Gray, Johannes Karreth, Christina Schneider, Jonas Tallberg, and Wen-Chin Wu for their helpful questions and comments. We also thank Martin Vieiro for his research assistance, and Megan Roosevelt and Brendan Connell for their help with the construction of the dataset used in this paper.